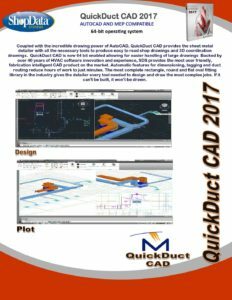 Coupled with the incredible drawing power of AutoCAD, QuickDuct CAD™ provides the sheet metal detailer with all the necessary tools to produce easy to read shop drawings and 3D coordination drawings. QuickDuct CAD is now 64-bit enabled allowing for easier handling of large drawings. 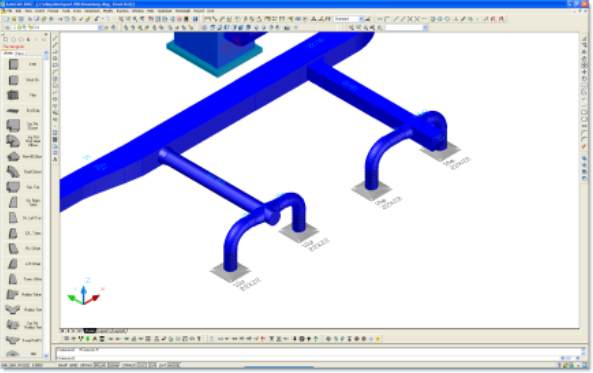 Backed by over 35 + years of HVAC software innovation and experience, SDS provides the most user friendly, fabrication intelligent CAD product on the market. Automatic features for dimensioning, tagging and duct routing reduce hours of work to just minutes. The most complete rectangle, round and flat oval fitting library in the industry gives the detailer every tool needed to design and draw the most complex jobs. If it can’t be built, it won’t be drawn. 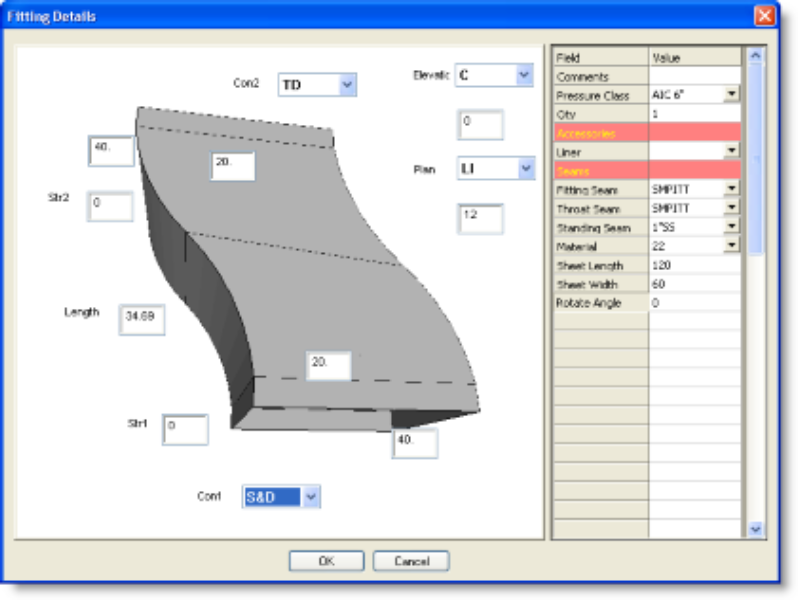 Direct download from QuickDuct CAD into Shop Data fabrication software is fully supported. 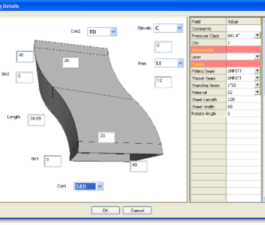 All fittings and shop standards are completely compatible for a seamless interface. Simply download the job, nest and cut. 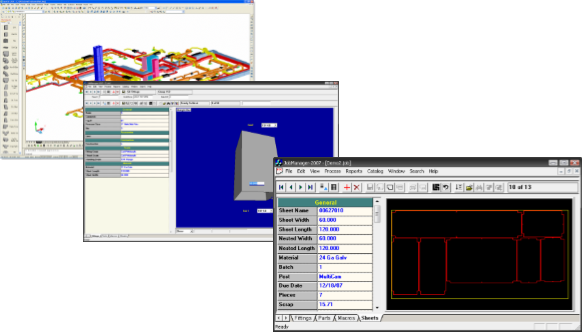 QuickDuct CAD’s automatic routing utility makes routing from point to point a one click operation. The routes allow elevation or offset changes for rectangular and oval duct lines and allow both elevation and offset changes for rolling round offset routes. Round routes also ask for length of flex to be applied at the end of the route for easy tap-to-grill routing. 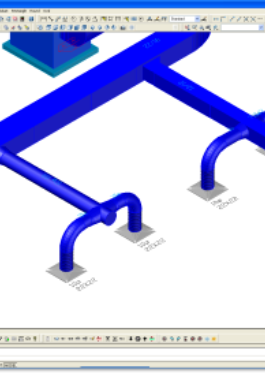 Connecting between two ducts is easy with QuickDuct CAD. Just select the two ducts and choose the type of transitioning duct you would like to use whether it be a simple transition, a square offset, or a radius ogee. No more guessing whether or not your duct and fittings will collide after installation. With the click of a button, a detailer can quickly and easily see in 3D where the ducts are colliding. 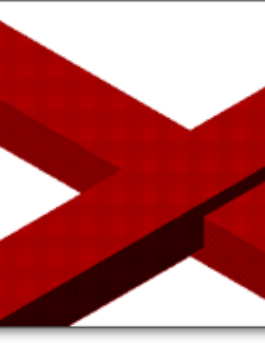 All colliding ducts are highlighted in red for easy view. 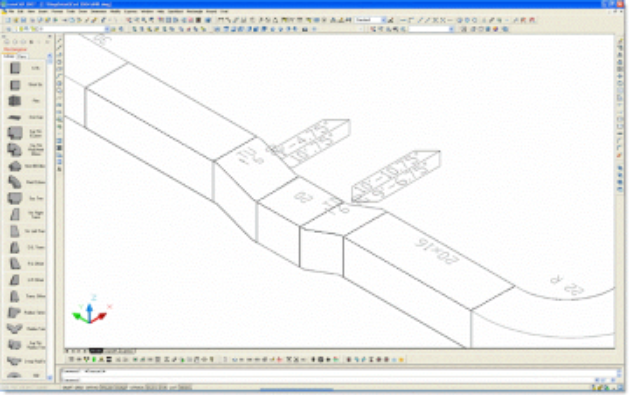 One of the most time-consuming parts of any CAD drawing is dimensioning. 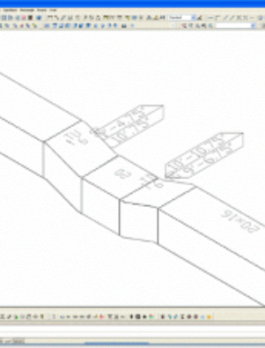 QuickDuct automatically dimensions size, length, offset, angle and elevation changes. User preferences are supplied for dimension orientation and a smart-rotation is applied to all dimensions which assure that they can be read from a fixed vantage point. Any dimension can be deleted or changed. Another time-consuming function is made easy with this helpful utility. A user preference for tagging sequence is supplied for trunk first or tap line first options. Tags can be set for individual tagging or exact-match, duplicate tagging. Tag prefixes are also supported. 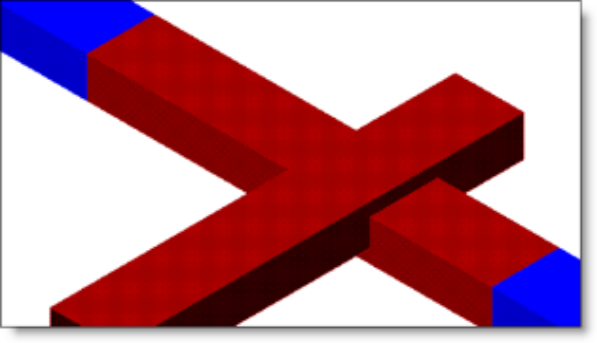 QuickDuct CAD picture edit make checking and modifying simple and easy. Changes made to the fitting automatically update the drawing. 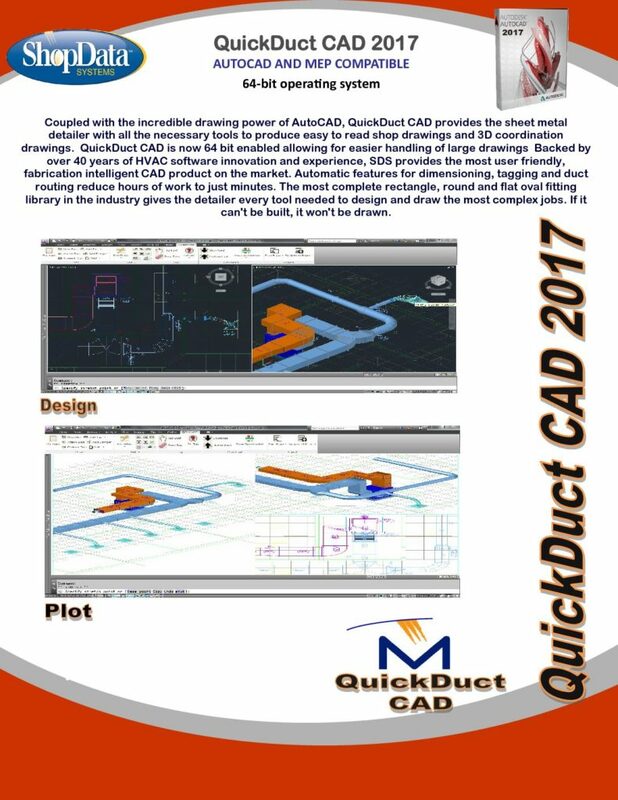 QuickDuct CAD has teamed with industry leading HVAC estimating software to provide its users multiple estimating programs on the market. 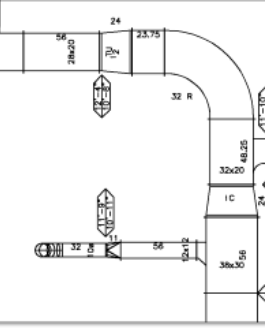 QuickDuct allows for quick, on-screen estimates of either the whole drawing or a user specified area. Using the Crystal Reports engine, complete fitting takeoff and equipment reports are generated from the 3D drawing in AutoCAD. Reports can be modified by the user with the Crystal Reports program. 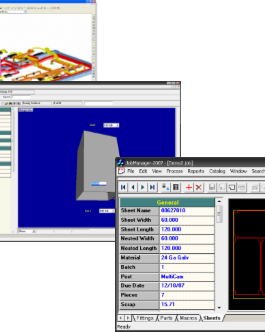 ShopData backs its software with an immense amount of metal fabricating experience and over 35+ years of business and innovation. No HVAC software company has more expertise! We offer hands-on, customized training at your site or ours. Take advantage of our 24/7 phone support through the annual Tech-Support and Update subscription.